I love sketches! I love to make sketches! I love to use sketches! Even though I make my own sketches and use them most of the time, it is fun for me to mix it up and use sketches created by other designers. 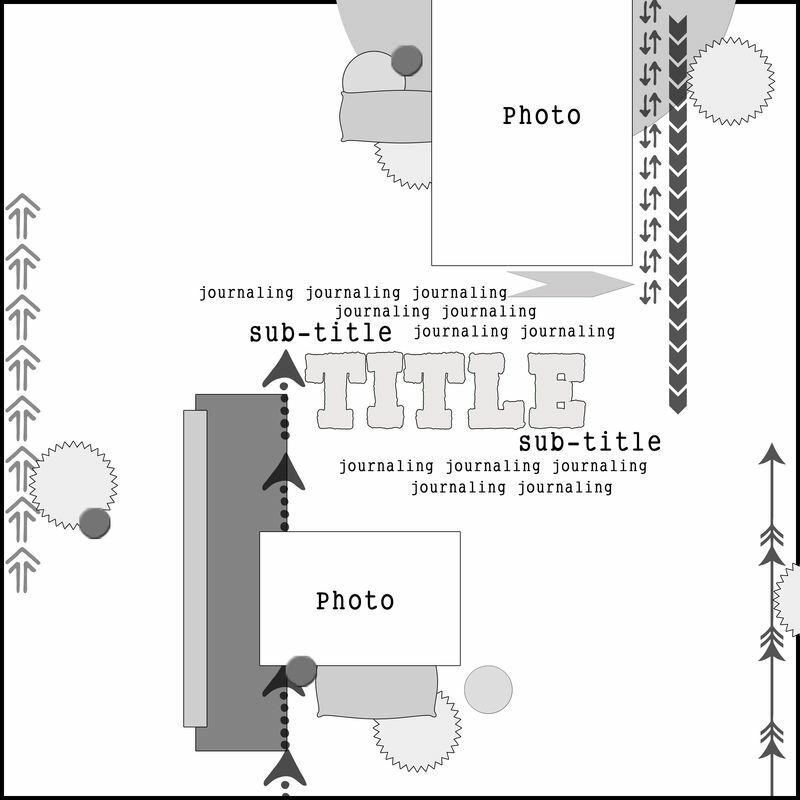 That is exactly what I did for the layout I am sharing with you today. I used the My Mind's Eye July Sketch created by Ronda Palazari. I found this sketch to be a little bit of a challenge for me because of the placement of the photos, but I think the end result came together fairly well. 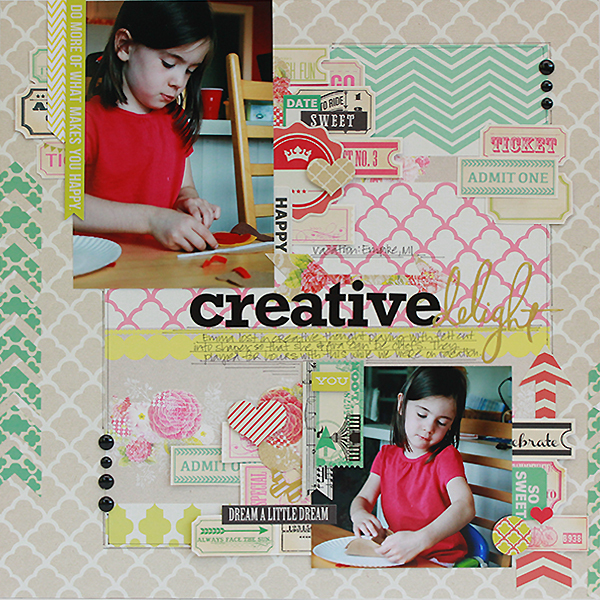 I love the look of little bits and pieces layered and tucked in here and there on layouts and I gave that I try on my layout. I used a lot of stickers, but I also fussy cut the little tickets from the patterned paper to use as well. I also really like the muted, softer, color palette especially when my photos are dark. It provides a wonderful contrast and helps the photos stand out a bit more. I almost always do my journaling by hand. I actually like my own handwriting and it is just so much faster than messing with the printer. If I don't have a lined journaling card to work with, I add my own lines using a metal edged ruler and pen or marker. I usually do my writing first and then I go back and add the lines underneath the words. Another fun technique I used was to placed the chevron stickers along one edge of my layout to that they were hanging over the edge of the background paper. I then trimmed off the excess and used them on the other side of my layout. I hope you enjoyed my take on the My Mind's Eye Sketch! Did you play along this month? Wonderful layout Juliana! 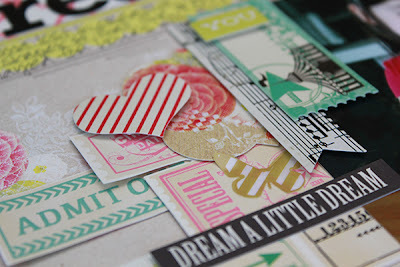 The layering is great and the papers from MME are awesome! Love your take on this sketch Juliana! Simply beautiful! All girly and so gorgeous! I played along, but mine is all boy!! ;-)) Love your work! Your layout is gorgeous! I love your clusters. Just perfect! Awesome job using the sketch! It's such a beautiful lay-out with lots of fabulous details. I love it! Beautiful use of the sketch, Juliana!! 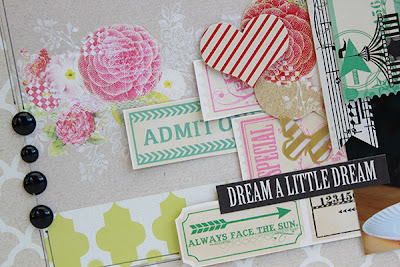 Love all of these colors together and all of the different embellishments you layered on your page! This is gorgeous!!! LOVING the colors and loveeeeeee the hearts!!! Gorgeous layout and I love the sketch you played with. Your writing is gorgeous, and it always looks so nice on your layouts. Wow, wow, wow! Uh-mazing job with that sketch, Juliana! 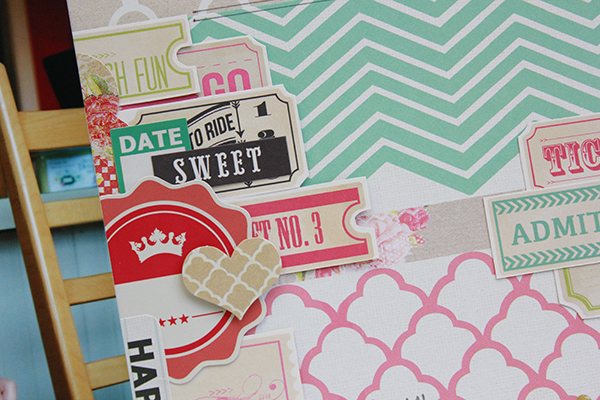 Love the mix of papers and love your chevrons on the side. And my jaw is hanging open at all the little details everywhere! Fab! Stunning! I love all the little bits and pieces that are so strategically placed! Love your sketches and your interpretation of others' sketches! 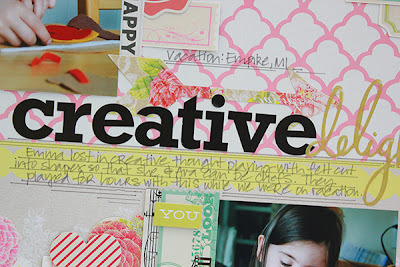 lovin the mix of pattern papers on this one!